No matter the weather, there is always time for sports. But you’ll need the right gear. Whether it’s basketball, baseball, or horseback riding, you’ll surely find what you need at Indiana’s excellent sporting goods stores. From baseball gloves, to utility knives, to fishing poles, be sure to check out these top 10 sporting goods stores in Indiana for all your sporting needs! J.L. Waters is the best place in Indiana for all your sporting needs. The customer service is outstanding, and the products are even better. 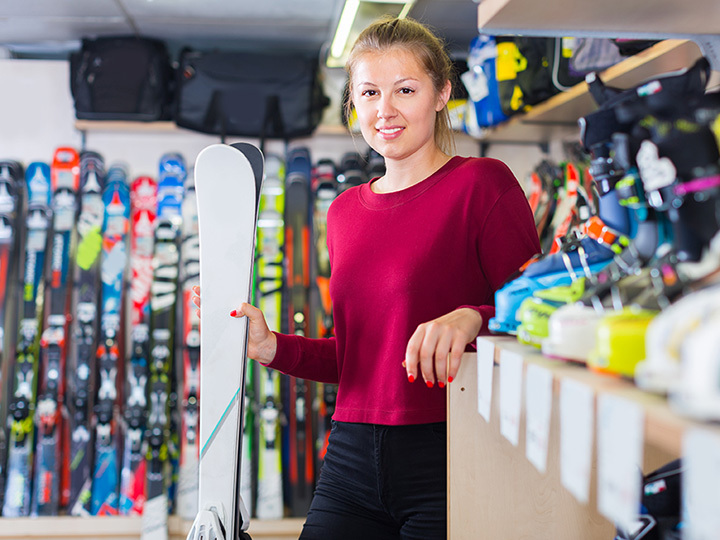 Many of the employees that work there are avid sports men and women, and they’ll help you find the best equipment for all your sporting adventures. If fly fishing is your thing, they have a wide variety of fly fishing equipment, with brands such as Orvis. In need of some new outdoor apparel? Check out their selections of Tilly, WigWam, Sierra Designs, and more! Whatever your sport is, J.L. Waters has what you need! For all your team sport’s needs, head on out to Pro-am Team Sports in Schererville, Indiana. Pro-am knows what it takes to be a winning team, and they pride themselves on creating branded apparel that customers can wear with pride. Carrying popular brands such as Adidas, Wilson, Under Armour, and more, there is something for everyone at Pro-am. They also have on-site print screening, embroidery, and sewing. Every uniform, equipment, or piece of spirit wear can be quickly customized to fit your team’s needs. Bush-Keller Sporting Goods has been a leader in team gear and athletic clothes and equipment since 1944. They pride themselves on creating personalized customer service, and has always been family owned and operated. They provide services such as in-house heat seal, embroidery, screen printing, custom artwork and more. They carry a variety of brands from Under Armour to Silver Creek Spirit War, Oxygen guards, and more. For all your gun and ammo needs, come to Albertson’s Sport in northern Warsaw, Indiana. Whether you’re looking to buy a new or used firearm, need more supplies for your current firearm, or a new utility knife, be sure to check them out! They carry brands such as Gerber, Henry H005, Taurus, and more. With thousands of stores throughout the U.S., Dunham’s Sporting Goods is for the avid sports enthusiast, exercise lover, or someone just looking to get in shape or purchase new equipment. A popular sport this time of year in Indiana is hunting, and Dunham’s has plenty of supplies. From Carhartt to Winchester and Remington ammunition, to Barska binoculars, Dunham’s has it all. Good foot is essential when hunting, so be sure to purchase a pair of Itasca boots on your way out! Hoosier Sporting Goods store in southern Columbus, Indiana, is locally owned and operated and has been serving the needs of athletic Hoosiers for over 70 years. They pride themselves on providing outstanding customer service and going above and beyond. They have a wide selection of sporting apparel and even provide apparel for local businesses. Need a new baseball? Hoosier Sporting Goods has you covered with their wide selection of Wilson baseballs, sold by the dozen. If you don’t see something in the store, be sure to ask if you can order it online! Kratz Sporting Goods store has been providing schools, teams, and other individuals with the best of the best in athletic apparel and equipment for over 50 years. They are your team sports specialists. Whether it’s cheerleading, baseball, basketball or soccer, Kratz Sporting Goods has it all! In need of a new bat? Kratz now has DeMarini and Louisville Sluggers available. Need some new cheer clothes? Be sure to check out their selection of Alleson Athletic. Grand Champion Tack and Saddlery, where equestrians live and breathe all things horses. The Indianapolis location has been serving customers for over 40 years, and providing outstanding products. Whether it’s healthcare such as deworming products, bandaging tape, or hoof packing, Grand Champion has all your horse’s healthcare needs. Looking for the perfect girl for that horse crazy kid? Be sure to check out their unique selection of Breyer horses! The Outpost is Indiana’s western wear and horse supplies store for all the equestrian enthusiasts out there. In business for over 25 years, the Outpost’s staff and customers share a passion for horses, and a passion for fashion. From clothing to hats, boots, saddles and more, there is something for every equestrian.